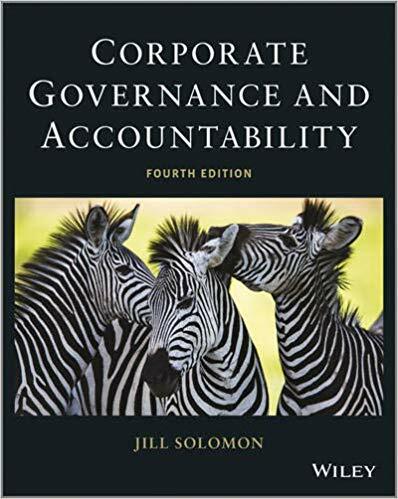 جهت دانلود کتاب Corporate Governance and Accountability 4th Edition با ما مکاتبه کنبد. کتاب Corporate Governance and Accountability 4th Edition پس از واریز هزینه ارسال میشود. ایبوک 111844910X در آرشیو گیگاپیپر موجود است. Providing readers with a discussion of corporate governance issues, including both theory and practice, this fourth edition incorporates codes of practice, policy documents and academic research. Figure 1.1 Framework of accounting and finance corporate governance literature. Figure 3.1 The UK experience. Why is good corporate governance important? Who wants the job anyway? Illustration 4.5: Fat cats: Leaner or fatter? What else can contribute to board effectiveness? Figure 5.1 Chain of share ownership in pension funds. What do we mean by ‘stewardship’? Figure 5.2 Forms of shareholder activism. Illustration 5.3: Hypocrisy among investment institutions: Corporate governance activists should carry a wealth warning! Figure 6.1 The Turnbull framework for internal control. Figure 6.2 Possible ingredients of an ideal corporate risk disclosure framework. Integrated reporting: The dawning of a new reality? Figure 9.1 The UK experience: Codes for the public and third sectors. Figure 10.1 Drivers of SRI and its role in CSR. Private social and environmental reporting: Mythicizing or demythologizing reality? Has corporate governance reform gone too far? Or has it gone far enough?